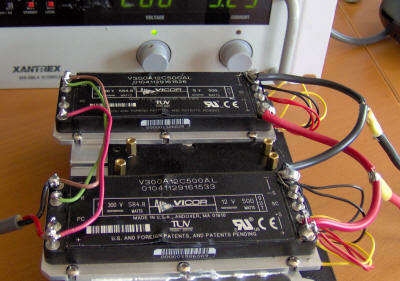 My previous "more 12 Volts" unit used a couple of 150W Vicor modules to provide 300W at 12VDC (really 13.2VDC). 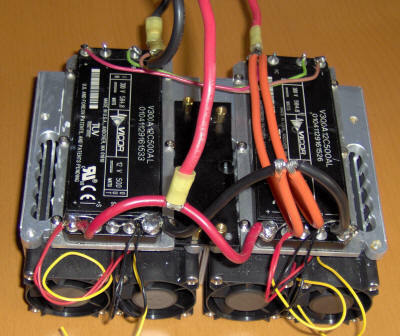 At the end I mentioned "There is almost no limit to the amount of power you can get at 12V since multiple modules of different sizes can be connected to the traction battery for different applications. The Prius can easily power an emergency communications setup for a police or fire department!" It turns out that I needed quite a bit of power at 12VDC to overcome a recently noted deficiency in the PriUPS system itself. A power failure that went unrecognized for over an hour allowed the batteries in the UPS to reach a badly discharged state, one in which the reliability of the power was compromised. The details are described elsewhere, but I thought it would be good to show how I realized one of the possible solutions to the problem, a "booster" for the Prius traction battery that will increase its output voltage. Below I describe the construction of a 1kW, 12V power source that runs off the Prius traction battery. Although in my application it's connected in series with the traction battery to boost the output voltage by 12V, this is not necessary, and by a slight change in wiring the 12VDC can be used as-is. Let me introduce a test setup you haven't seen before. I was looking for a better way to simulate the Prius traction battery as well as those of other hybrids. As nice as the batteries were, they lacked a certain versatility! I picked up a Xantrex 0 to 600VDC, 0-4Amp supply on eBay at a (very) good price. It requires a 230VAC input and provides up to 2.4kW of DC. Sitting on top of the supply is a variable load. It comprises 3 modules, each of which can dissipate 300W and whose load current is adjustable. 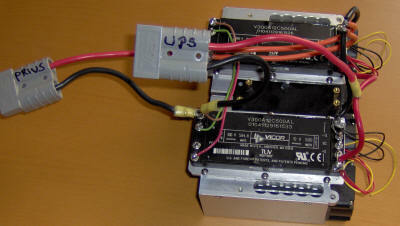 This higher-power unit uses two Vicor 500W 12V modules instead of the 150W modules in the previous project, each with its own heat sink. Unsurprisingly, these modules are much larger and, in fact, only fit on the heat sink/fan assembly with a slight overhang which is of no significance. Only one is hooked up here. I wanted to test it alone at a range of powers and voltages so that if there were any surprises I would find them now and not after I had finished the system and connected it. One discovery I made is that the "Bergquist pads" I used for good thermal conductivity between the Vicor module base plate and the heat sink had a higher thermal resistance than expected, and there was a noticeable temperature difference between the plate and the fan-cooled heat sink. I removed the pads and squeezed some white thermal gloop between them, resulting in a much better contact. In this view, we've progressed to wiring both modules to primary power and connected them in a current-sharing configuration. Although the connection is supposed to assure that the current is shared equally, I carefully wired the outputs of the modules in parallel and then tapped the outputs at the center point of the connections (black and red arcs on the right). Probably an unnecessary precaution. I tested the modules at 900W power output instead of 1kW because that's the limit of the three load banks. Temperature rise of everything but the test leads themselves was nominal. I measured only a 30mV drop across the Anderson connectors and they were barely warm. The test leads with "banana plugs" were quite warm - they're not designed for this kind of heavy current, and, of course, will come nowhere near the system when it's in use. Here's the complete booster module. By plugging the connector marked "Prius" into the connector and the car and the one marked UPS to the UPS batteries, the voltage delivered will be 12V higher than before, which compensates for the problem described earlier. This view shows more detail of the wiring. 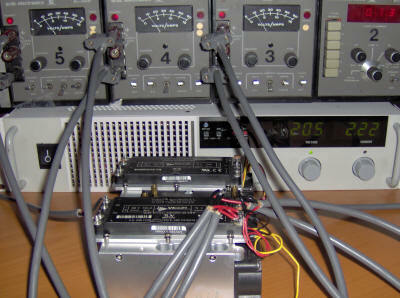 The two parallel orange wires increase the current carrying capacity. 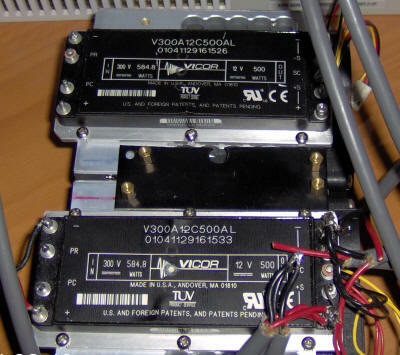 The fans run on the 12V from the Vicor modules directly, and are not subjected to the voltage from the traction batteries. If you've been thinking "Why does he need a 1kW 12V supply when the Prius is providing an average of only 3kW at over 200V" you're a bit ahead of me. It's true that the average power delivered by this unit will be a meager 150-200W (its (12V/220V) fraction of the power) in normal operation. In fact, I considered using only one Vicor module, but decided on two because I had them and I didn't want this to be a weak link in the system. The Prius battery can deliver a peak current of over 100A, and the UPS itself can deliver well over the 12kW of its continuous rating on peak surges. The power required to run the house is very "peaky." If the well and the refrigerator turn on at the same time as the Prius starts supplying power to both the UPS and charging its batteries, it's easy to see how the peak current can greatly exceed the average. Unlike batteries which can supply much higher peak currents for a brief period (think "starting a normal car"), the Vicor modules will shut down if their ratings are exceeded. Hence, I made sure their ratings were more than adequate.